Display your photos the way pros do at leading art fairs: in a Floater Frame. 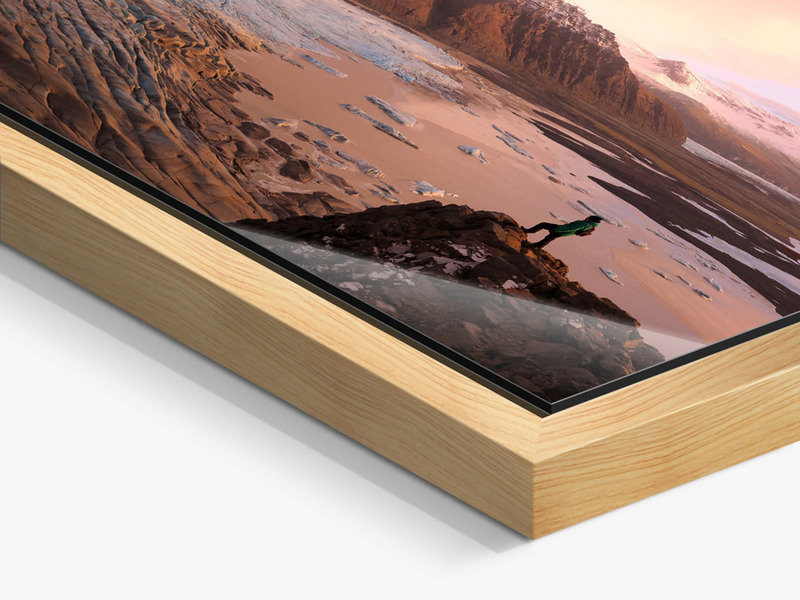 A gap between your image and the solid wood frame creates the impression your picture is levitating. Every room has its own distinctive ambiance. Selecting the right frame will go a long way toward maintaining that mood. We offer a range of styles and materials that all differ significantly in terms of how they look and the effect they have. 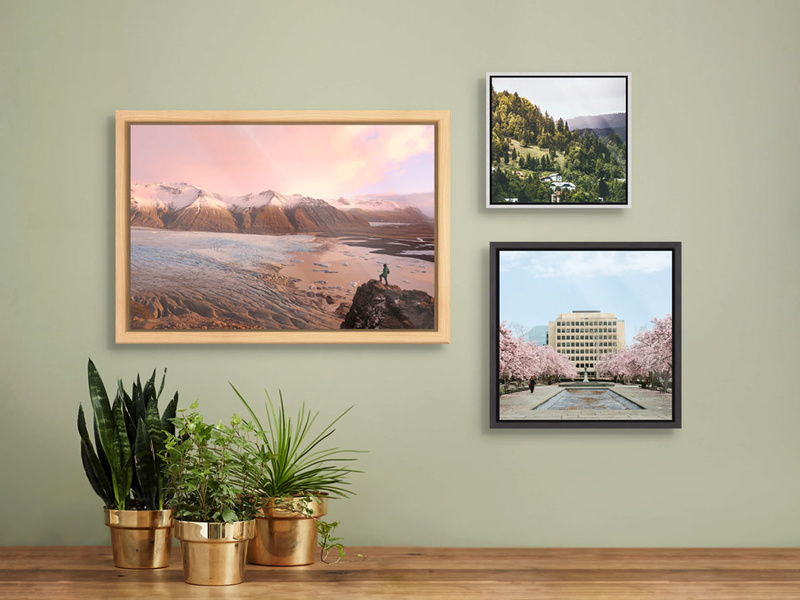 Find the perfect frame to go with your décor. Regardless which printing and/or mounting options you choose, your photo can become even more expressive in a Floater Frame. With some of our mounting options, you even have the choice between various photo papers. Choose from the following options to define the look of your picture. Thanks to a small gap between the frame and the edges of your image, the picture appears to float inside the frame. This gives it a unique presence. 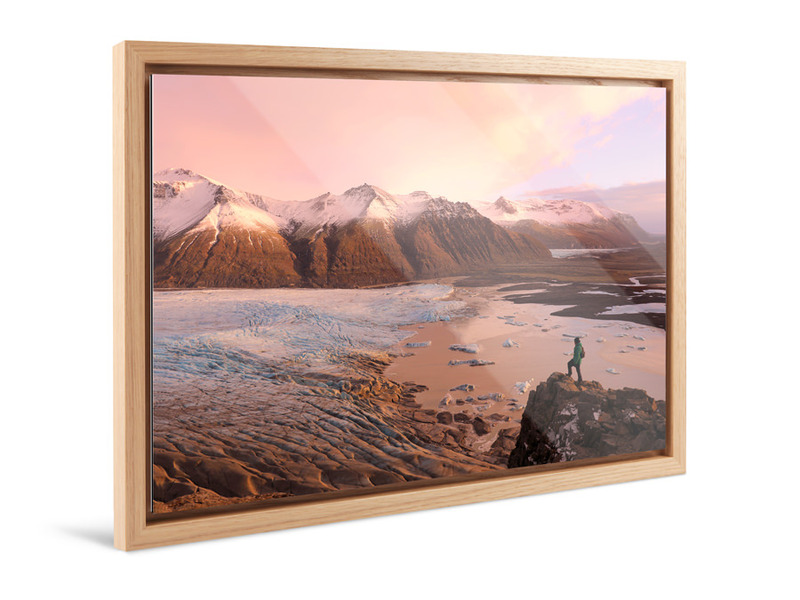 A contemporary frame for your photograph that is both elegant and subtle. Our Floater Frames arrive ready to hang. The metal picture hanging hardware on the reverse of the frame is included in the price. We have many beautiful frames to choose from. But some are simply exceptional. The gallery frame with shadow gap has something everyone is looking for: That bit of “je ne sais quoi”. 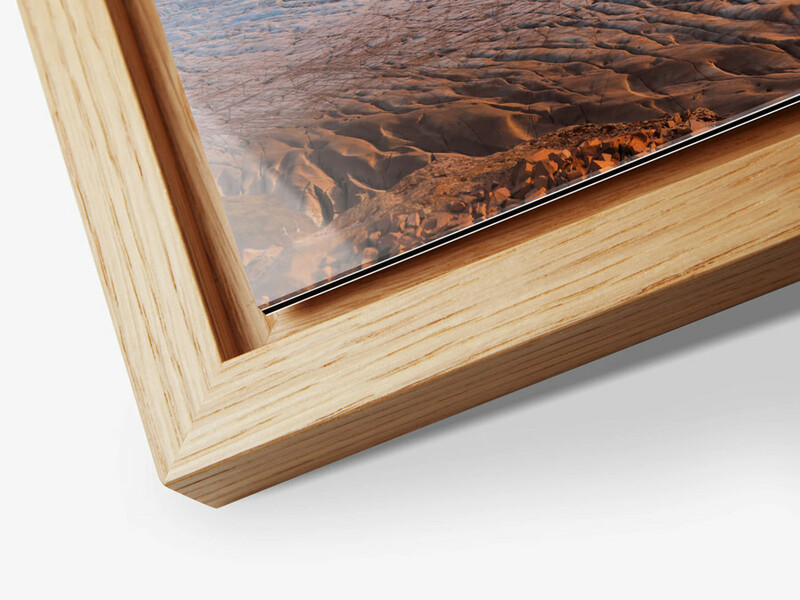 Your photo is not just nicely framed – it has class. The floating effect enriches its overall appearance and conveys independence – your work is free and unbound within its surroundings and yet harmoniously included in the interior concept. A paradox? A little one, maybe. But you should see for yourself. Many have done so before you: After all, our gallery frame with shadow gap is a real bestseller. We have employed that weightless, floating effect in some of our other products as well, e.g. in our shadow box frame with more depth and the ArtBox in wood, which is a little subtler but still very chic. You are not a fan of wood? No problem. We can create depth of field just as well without a frame. Laminates of original photo prints under acrylic glass are also a top seller at WhiteWall. A modest acrylic glass thickness of just 2 mm will already give you some amazing effects. At 4 mm you are coming into the professional segment, and at 6 mm your pictures will have an unrivalled depth with 3D effect. You feel like you can step right into the picture, your memory – and you will feel like you want all your pictures to look this impressive. You are an amateur photographer but have that one picture that really stands out from all the rest? Then you should definitely allow yourself the luxury of an original photo print or a direct print under 2 mm acrylic glass. You are a professional and are looking for the perfect presentation for your next exhibition? 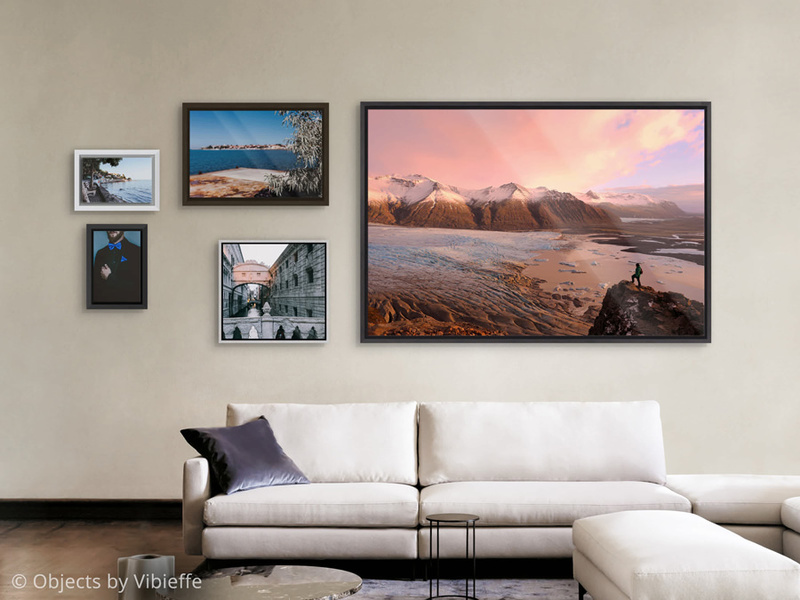 Give WhiteWall a try with an original photo print under 4 mm acrylic glass or order our sample set with a whole range of products and papers. If you are looking for something that will stay beautiful in wind and weather and don’t want to skimp on quality, then you have come to the right place: WhiteWall direct prints on Forex, aluminium Dibond or brushed aluminium are all suitable for roofed outdoor areas and our HD metal print can even stay in the rain without any detriment. Why not give yourself a sunny view out the window on a rainy day: With a HD metal print you can have sunshine in November on your balcony. We have made a name for ourselves with the colour brilliance of our products – and we want to keep it that way. That is why we will do our very best for your favourite pictures. That is how good pictures become great ones. We here at WhiteWall are professionals – and we will make you look like one too.